Plot showing the amino acid preferences for each position of influenza HA. Letter heights are proportional to the preference for that amino acid and are colored according to their hydrophobicity. Epidemic influenza is a serious public health concern each year, as the virus rapidly evolves to evade immunity acquired through vaccination and/or previous infection. The most effective antibodies against influenza are generated against the viral hemagglutinin (HA) protein. The virus evades these antibodies by acquiring amino acid substitutions in the antigenic sites of HA. Thus, HA is said to undergo antigenic evolution. High mutation rates and selective pressure from the immune system are proposed to drive HA’s antigenic evolution. However, since other viruses with mutation rates similar to influenza do not display a similar rate of mutation within their antigenic sites, these factors may not completely explain the high rate of antigenic evolution in HA. An additional hypothesis is that HA is especially tolerant of mutations. To test this hypothesis, postdoctoral fellow Dr. Bargavi Thyagarajan, in the laboratory of Dr. Jesse Bloom (Basic Sciences Division), performed comprehensive functional screening of mutant HA proteins. The researchers found that antigenic sites within HA are highly tolerant of mutations, suggesting that mutational tolerance is an additional means by which HA is able to so efficiently evolve to evade the immune system. To generate a comprehensive library of mutant HA proteins, the researchers performed deep mutational scanning. In this technique, a library of mutated gene variants is synthesized and introduced into cells. Cells with functional protein variants are enriched, while those with inactive variants are lost. Libraries are then retrieved from both pre- and post-selection cells and sequenced to determine the frequency of each variant. Using deep mutational scanning, the authors generated ~85% of all possible HA DNA codon variants and ~97% of all possible HA amino acid variants. Mutant viruses were then generated using these libraries of mutant HA-coding DNA introduced into cells along with DNA encoding the other seven influenza genes to allow viral packaging to occur. The authors next used high-throughput sequencing to identify the frequency of mutations before and after selection for viral growth and used these data to determine the preferences of each site in HA for particular amino acids. While many sites are tolerant of several amino acids, certain sites prefer a single amino acid. Overall, these results were consistent with existing knowledge relating to the HA protein, indicating that deep mutational scanning faithfully recapitulates known aspects of HA structure and function. As deep mutational scanning is an artificial procedure, the authors wondered if their results accurately represented the effects of natural constraints on HA evolution. They thus compared their experimentally determined HA amino acid preferences to those derived from naturally evolving viruses. 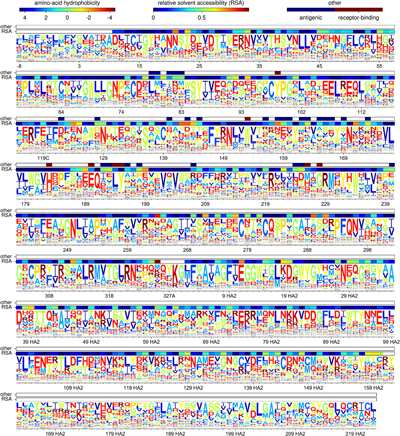 Strikingly, the use of amino acid preferences allowed the authors to develop a model for HA evolution that is much more accurate than previous models, again indicating the utility of deep mutational scanning for capturing features of natural influenza evolution. Lastly, the authors tested if the mutational tolerance of HA’s antigenic sites might be a general feature of other influenza proteins. An analysis of antigenic sites of the influenza nucleoprotein (NP) revealed no particular tolerance for mutations, suggesting that mutational tolerance is at least somewhat exclusive to HA. "A challenge in studying the natural evolution of influenza is separating the effects of external selection pressures from inherent structural and functional constraints. The evolutionary patterns observed in natural sequences are shaped by a combination of inherent mutational tolerance and external pressures such as immune selection. Our data demonstrate that the antigenic sites in HA are unusually tolerant to mutations, implying that inherent evolutionary plasticity at sites targeted by the immune system is one factor that contributes to influenza's rapid antigenic evolution," said Dr. Thyagarajan. The use of deep mutational scanning may also have additional implications for laboratory study of influenza evolution. "Our work shows that it is possible to assess the impact of each possible mutation to influenza proteins given some laboratory imposed selection pressure. This ability will allow us to quantitatively relate the selection pressures that we impose in the lab to those that shape influenza evolution in nature," said Dr. Bloom. Thyagarajan B, Bloom JD. 2014. The inherent mutational tolerance and antigenic evolvability of influenza hemagglutinin. eLife e:03300.